One of the biggest challenges in managing broiler-breeders during hot weather is the large variation in air speed between the slat and the scratch areas of a tunnel-ventilated house. It is not uncommon, during hot weather, to find air speeds on the slats to be half that of those in the scratch area (Figure 1). The reason for the variation is due to the simple fact that air will tend to take the least path of resistance, and in a broiler-breeder house the path of least resistance is the scratch area. In the typical broiler-breeder house the distance between the floor and the ceiling in the scratch area can be over 12', whereas the distance between the slats and the ceiling is often barely over 6'. In addition, there is a substantial amount of equipment in the relatively confined slat area (nests, feeders, drinkers) as well as exposed side wall studs that tend to discourage the air from moving along the side wall (Figure 3). The combination of these factors results in a scenario where the air can flow down either a small clogged pipe along each side wall, or a relatively large pipe essentially free of obstructions in the center of the house. It is only natural for most of the air to move down the center of the house. 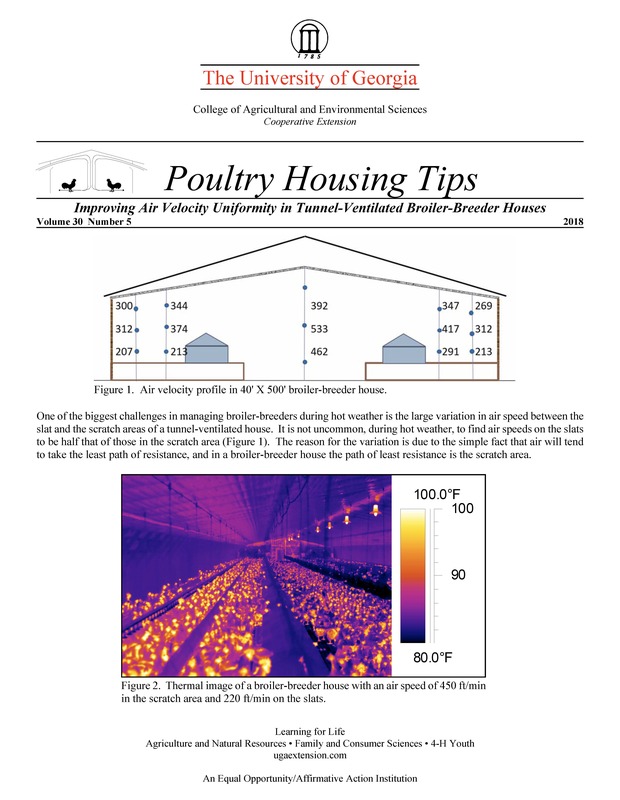 The fact that most of the air will flow down the center of the house can lead to the creation of two very different environments within a broiler-breeder house (Figure 2). Lower air velocities on the slats lead to lower air exchange rates compared to the scratch area. Whereas the air in the scratch area may be exchanged at a rate of once per minute, due to the much lower air speed on the slats it can often take over two minutes for the air to travel from the pads to the fans which means the air will heat up twice as much. The birds on the slats will also be heated by radiant heat emanating from the curtains as well as hot air entering through loose fitting side wall curtains. The combination of low air exchange rates on the slats, radiant heat from side wall curtains, and leakage can result air temperatures on the slats being five degrees warmer than in the scratch area (Temperature Sensor/Thermostat Placement in Broiler-Breeder Houses. Poultry Housing Tips. Vol. 23 no. 6). Making matters worse, when the reduced “wind chill effect” is taken into account due to dramatically lower air speeds, the effective temperature for the birds on the slats can be ten degrees or higher than for those in the scratch area (Figure 4). Improving environmental conditions for the birds on the slats is difficult. Totally enclosing the side wall can help. Covering the exposed side-wall studs with plywood and installing insulation will not only eliminate radiate heat and leakage, but will also tend to improve air speeds near the side wall. Though conditions would be improved, the air speed on the slats could still be significantly lower than the slats due to the still relatively confined nature of the slat area compared to the scratch area. To substantially increase air speeds on the slats, the cross-sectional “appearance” needs to be modified. We need to make the slat area more similar the scratch area in terms of openness. Specifically, the slat height needs to be reduced and side wall height increased. Figure 6 shows a broiler-breeder house with a more desirable cross-sectional profile when it comes to promoting air velocity uniformity. The 40' X 600' house has an 18" slat height and approximately 12" of litter which results in the slats only being about 6" taller than the scratch area (Figure 7). The reduction in slat height relative to the scratch area could have also been obtained by building-up the height of the scratch area. A second unique characteristic of the house is that the distance between the slats and the ceiling at the side wall is approximately eight feet. The minimal difference in relative ceiling height from side wall to side wall helps to create a more consistent open path for the air to flow down the house, resulting in a variation in air speed of approximately 100 ft/min when all the tunnel fans were operating (Figures 8 and 9). Though this level of uniformity is of course excellent, environmental conditions could be further improved by installing a flat instead of a pitched ceiling, as well as totally enclosing the side wall. It is important to note that in addition to improved air speed uniformity the higher ceiling will tend to promote more uniform lighting levels across the width of the house. The disadvantages of the more “open” design are a slightly higher construction cost, and a larger cross-sectional area which would require more tunnel fans to be installed and operated to obtain the typically desired air speed of 600 ft/min. That being said, considering what heat stress can cost in terms of broiler-breeder performance, the advantages of the a more open and uniform cross-section should outweigh the relatively minimal additional costs.